Well, the season is upon us and after a weekend of Christmas shopping and decorating the tree, I am definitely in the spirit of things. On the crafting front, I have pretty much dedicated myself to Christmas crafting for the next three weeks (yes, Christmas is only three weeks away). As I was getting the decorations out of storage this weekend, I found some project supplies that I bought in the after Christmas sales last year - and can I just say that I was thinking very ambitiously a year ago, let's hope I can get it all done. I made these cards using leftover paper scraps from Christmas layouts I did years ago. I love how this paper is a little non-traditional in terms of color, using hot pink rather than red. Very cool! 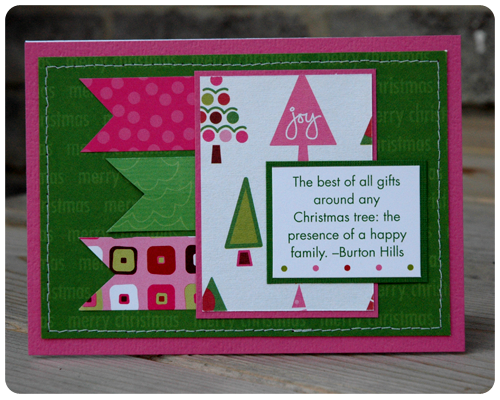 So what about you, are you making your own Christmas cards this year? If you are, I would love to see what you have done - please link to your work in the comments. And I hope you'll follow along all this month to see what else I add to my Christmas Collection. These are so cute! I really like the non-traditional color scheme as well and the designs are really cute! Can't wait to see what else you'll be making this month. Thank you Sara. Pink makes everything fun, doesn't it?